A frittata might be one of our favorite dishes. The perfect frittata is soft inside with a texture similar to custard. You can pack just about anything into it. 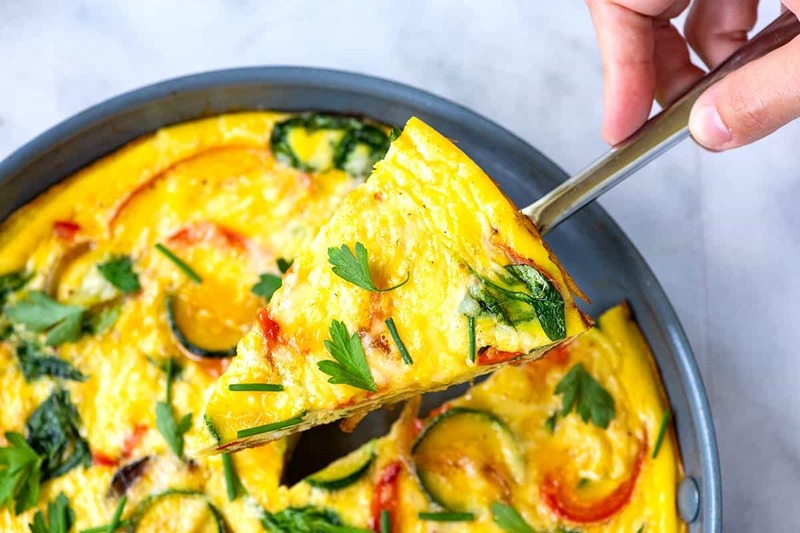 In this vegetable frittata, we add lots of colorful and tasty veggies, cheese, and herbs. 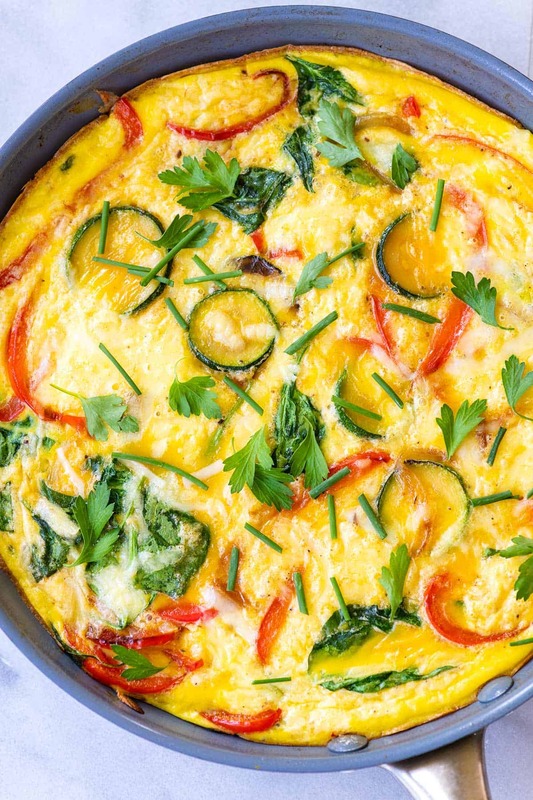 Jump to the Easy Vegetable Frittata Recipe or read on to see our tips for making it. When I say frittatas are one of our favorite dishes, I’m not kidding. 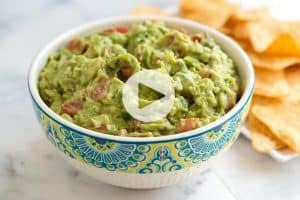 They are easy to make, inexpensive, and delicious hot or cold. Make this one night and have leftovers for breakfast, lunch or dinner the next evening. Frittatas are perfect for cleaning out the fridge. Have half a zucchini in the veggie drawer? Use it! Leftover roasted squash or roasted vegetables in the refrigerator? Perfect, add them to your frittata. 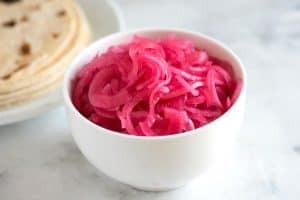 They also store well, so you can pack them up for on-the-run breakfasts, add them to an English muffin for breakfast sandwiches or serve them cold with a salad for lunch. They even reheat well in the microwave! I’m sure we’ve all had sub-par frittatas before, so let’s dive into how to make frittatas best! Once you know how to make the perfect frittata, you’ll be hooked! Frittatas are easy to master, promise. The perfect frittata should be creamy and soft in the middle, not sponge-like or dry. When making frittatas, use an oven-safe, non-stick skillet or a well-seasoned cast iron pan. Everything is cooked in the skillet, so the non-stick qualities help when removing slices for serving. If you don’t have a skillet that’s appropriate for the oven, you can bake frittatas in a 2-quart baking dish instead. Scroll down for our tips for frittatas made in a casserole dish. The ten eggs to 10-inch skillet ratio get you a not-too-thick, but not-too-thin frittata, but if you only have a 12-inch skillet, don’t worry! The frittata will be a bit thinner, and it might cook a little bit quicker, but it will still be excellent. For a 12-inch skillet, you can also add two more eggs to the mix and increase the dairy to 6 tablespoons. It’s up to you. We aren’t the only one preaching this one. Look around the internet, and you’ll see that most recipes call for full-fat dairy. If you’ve seen our creamy scrambled eggs recipe, you know that we advise that you don’t add anything to the eggs. No cream, no milk, just the eggs, salt, and pepper. It’s the cheese that makes frittatas extra delicious. Use a flavorful, melty, and oozy cheese in the egg mixture. Try shredded cheddar, Gruyere (my favorite) or fontina. For more cheese action, dollop a creamy cheese like ricotta, cream cheese or goat cheese right into the skillet. The creamy cheese won’t mix into the frittata, but after its baked, you’ll have pockets of gooey cheese throughout. Yum! Start cooking the frittata on the stovetop — for about 1 minute. When the outside edges of the frittata turn a lighter color, and they start to set, slide the skillet into a preheated oven to finish cooking. Finish cooking the frittata in the oven. We use a 350 degree Fahrenheit oven and bake somewhere between twenty and thirty minutes. Keep an eye on the frittata as it cooks, play it safe and check it a few minutes before it’s supposed to be done. You are not looking for a brown top, just one that looks cooked and barely set. Cook your vegetables and mix-ins (like sausage or bacon) in advance. Add the mix-ins and the egg mixture to a lightly greased two-quart baking dish and bake the frittata in a 350 degree Fahrenheit oven until the top looks barely set and when you wiggle the baking dish, the frittata jiggles ever-so-slightly. (A 9-inch square casserole dish works well). Use fresh or leftover vegetables. For fresh vegetables, cook them before mixing with the eggs. Heartier veggies like onion, potatoes and winter squash will take longer to pre-cook than tender greens like kale, spinach or Swiss chard. 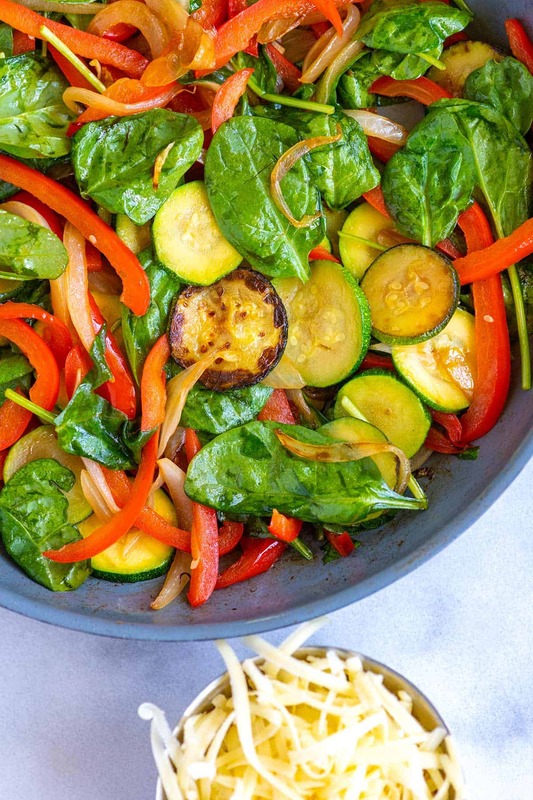 For leftover vegetables, reheat them in the skillet before adding the egg mixture. Add fresh herbs like basil, chives or parsley. You can do this two ways: whisk them into the egg mixture or scatter them on top of the cooked frittata. You can serve frittatas straight from the oven or cold — both are delicious. 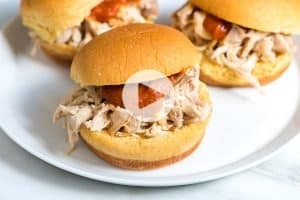 You can even reheat leftovers for a minute in the microwave. Cooked frittatas store well, wrapped in the refrigerator for two to three days. We don’t recommend freezing them since the freezer changes the texture of the dish. The best frittata has a texture similar to custard. Whisking in a bit of full-fat dairy like cream, half-and-half or even whole milk is essential for the best texture. Also, play it safe when baking the frittata and check it a few minutes before it’s supposed to be done. Perfectly cooked frittatas look barely set on top and tremble — like jello — after giving the pan a gentle shake. In a medium bowl, whisk the eggs with cream, 1/2 teaspoon of the salt, pepper, and the cheese. 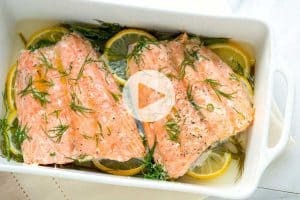 Heat the olive oil in an oven-safe 10-inch skillet (non-stick or a well-seasoned cast iron pan are best). Add the zucchini, onions, and bell pepper. Cook, stirring every once and a while until the onions are soft and the zucchini and bell peppers have a little color; about 5 minutes. Season with 1/4 teaspoon of salt then add the spinach. Toss the spinach around the pan until it’s ever so slightly wilted and bright green. Turn the heat to low. Give the egg mixture another whisk then pour into the skillet. Shimmy the pan back and forth a bit to distribute the egg around the vegetables. When the edges of the frittata begin to set and turn lighter in color, slide the skillet into the preheated oven; about 1 minute. Bake for 20 to 30 minutes, until the eggs are barely set and the frittata trembles — like jello — when you give the pan a gentle shake. Keep an eye on it as it bakes and check the frittata a few minutes before it’s supposed to be done. You are not looking for a brown top, just one that looks cooked and barely set. Serve the frittata hot or cold with fresh herbs on top. We call for cream, half-and-half or whole milk, but, sour cream, crème fraîche, and ricotta cheese also work. For a frittata with pockets of gooey cheese, add a few dollops of soft creamy cheese like ricotta, cream cheese or goat cheese. You don’t need to follow our exact recipe when it comes to the vegetables you use in your frittata. For a 10 egg frittata, stick to 4 to 5 cups of fresh vegetables. 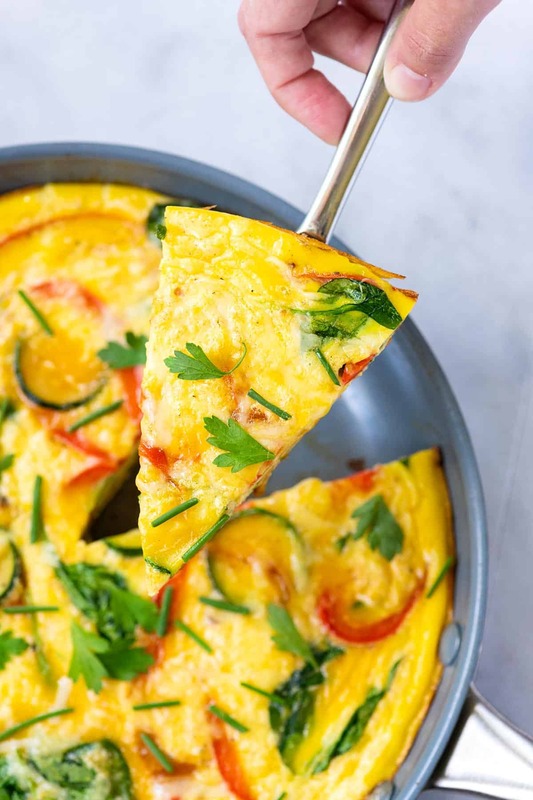 Use leftover veggies in the frittata: Re-warm leftover vegetables in the skillet before mixing with the egg mixture. Use 3 cups of previously cooked vegetables. How to make an oven-baked frittata in a baking dish: Cook your vegetables and mix-ins (like sausage or bacon) in advance. 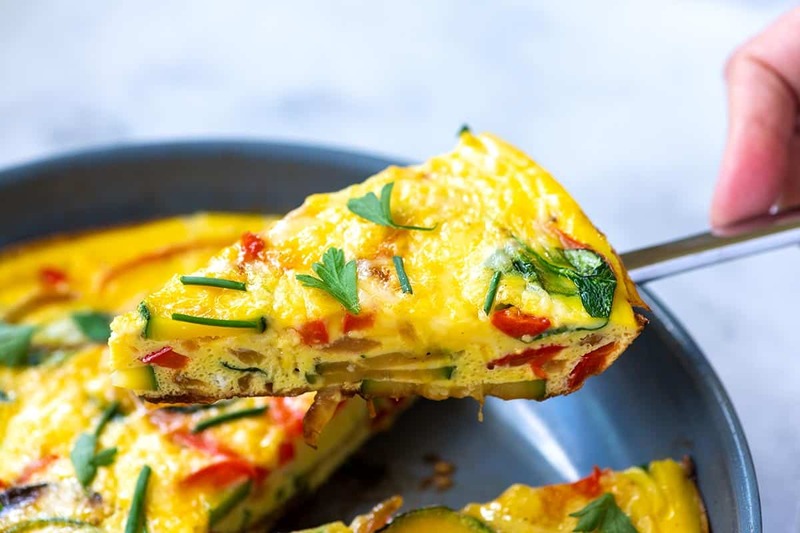 Add the mix-ins and the egg mixture to a lightly greased two-quart baking dish and bake the frittata in a 350 degree Fahrenheit oven until the top looks barely set and when you wiggle the baking dish, the frittata jiggles ever-so-slightly. Nutrition facts: The nutrition facts provided below are estimates. We have used the USDA database to calculate approximate values. We used cream in our calculations.